These images are remarkably accurate. 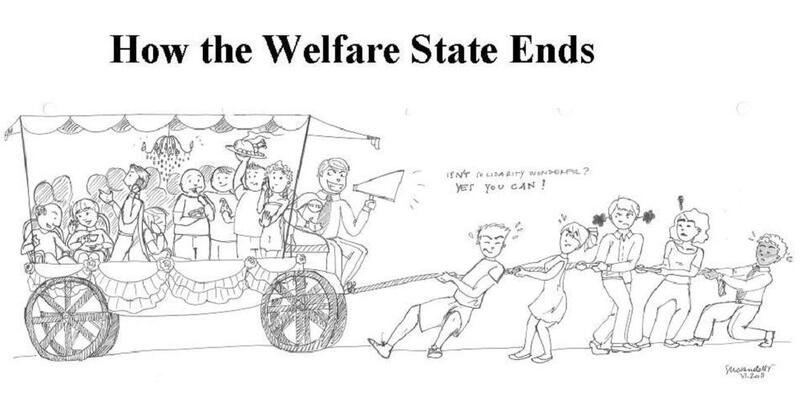 The welfare state starts with small programs targeted at a handful of genuinely needy people. But as politicians figure out the electoral benefits of expanding programs and people figure out the that they can let others work on their behalf, the ratio of producers to consumers begins to worsen. When the government gets so big that it distorts the behavior of the private market then it is too big. The federal government is now spending 24.8% of GDP and traditionally for the first 150 years of our nation’s history we spent under 5% unless in wartime. This massive spending now by the federal encourages people to lie in order to get money for the government too instead of trying to work hard to earn money in the private market. Why is big government bad for an economy? The easy answer is that big government usually means high tax rates, and this penalizes work, saving, investment, and entrepreneurship. And perhaps some of the spending is financed by borrowing, and this diverts money from private investment. That’s a correct answer, but it’s only part of the story. In most cases, there is added damage because politicians spend money in ways that further undermine incentives to produce. For instance, let’s assume a government spends $1 billion on some sort of redistribution program. Extracting that money from the productive sector of the economy obviously will cause some damage, but it’s also important to estimate how the supposed beneficiaries of the money will react. What if they decide to earn less income in order to be eligible for the handouts, as even the statists at the OECD have recognized? Let’s look at an example from Greece, showing how handouts distort behavior and corrupt people. Here are some remarkable tidbits from a Wall Street Journal story. The Greek health ministry is investigating on Zakynthos after local officials flagged records showing what they said is an implausibly high number of disability claims for blindness. About 1.8% of the island’s population of 39,000 claimed the benefit last year, according to the health ministry. That is around nine times the prevalence of blindness estimated for many European countries in a 2004 study published in a World Health Organization journal. Among those who put in for the blindness benefit on Zakynthos, a local official said, were a taxi driver and a bird hunter. …But the island is hardly alone, according to health ministry officials, who say fraudulent disability claims are a problem across the nation… Zakynthos Mayor Stelios Bozikis on a Greek television talk show said residents angry about the benefits crackdown and other financial overhauls pelted him with yogurt at a recent event. Before sneering at the Greeks, keep in mind that “disability” claims also are rising in the United States, which is rather remarkable since jobs have become less arduous over time. Heck, the Social Security Administration decided to give disability payments to a grown man who gets his jollies by wearing diapers. I’m not sure if that’s better or worse than the Greek government deciding to reward pedophiles with disability payments, but taxpayers are getting screwed in both examples. Let’s go back to the story and look at a rough estimate of how much fraud exists. In an attempt to root out fraud, the Greek health ministry recently required disability claimants nationwide to register in a centralized database, appearing in person or sending a representative. The registration resulted in 36,000 fewer disability claims than in 2011, the health ministry said. The ministry alleges these dropped claims were fraudulent, in many cases reflecting multiple claims for the same disability or payments in the name of dead beneficiaries. It also alleges that some doctors accepted money for false diagnoses and some local politicians signed off on the benefits to win support, and said it is giving public prosecutors information about areas where it suspects a high level of fraud. Only 190 of the nearly 700 people it says had been collecting the blindness benefit on Zakynthos participated in the registration, the ministry said. I have no idea if Zakynthos is representative, but that’s an incredibly high fraud rate. And this is just a glimpse at the workings of one government program. Now multiply that by some large number and you’ll begin to understand the damage caused by government. And America is not immune. When politicians make it easier to ride in the wagon than to pull the wagon (as this cartoon illustrates), society sooner or later gets in trouble. Thank you for writing. As President, it is my privilege to hear from Americans like you who take time to offer their perspective on the serious issues facing our Nation. I appreciate your message and value your input. From putting Americans back to work to expanding access to medical care, my Administration continues to take bold action to do what is right for our Nation. We have enacted the most comprehensive financial reforms in decades, rescued and helped retool our auto industry, expanded student aid to millions of young people, helped level the playing field for working women, and made the largest investment in clean energy in our history. Because of the courageous acts of our service members, we have been able to end the war in Iraq and take down Osama bin Laden. We have also made historic commitments to provide for our troops as they return home. Securing our country’s future will take time, but I will not stop working to rebuild the kind of America where everyone gets a fair shot, everyone does their fair share, and everyone plays by the same rules. I am always eager to hear ideas that will help our country adapt to changing times and lead us toward a brighter day. The enduring American spirit is revealed in the letters I receive, and I remain dedicated to ensuring it is reflected in our efforts to improve the lives of all Americans. Thank you, again, for sharing your views. I encourage you to explore www.WhiteHouse.gov to learn more about the ways we are moving America forward.